#Alphabet Trending at Number 1 at Twitter: Are the People at Google Reading The Syllabic Origins of Writing and the Alphabet? Even if Not, We Are AGAIN Miles Ahead of the Trend! #Alphabet is currently trending at Number 1 at Twitter. 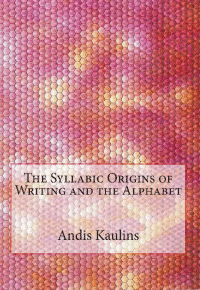 The Syllabic Origins of Writing and the Alphabet? Even if Not, with ABCs we are AGAIN miles ahead of the trend. We are a bit late on this due to our massive work on the ancient land survey of Native America by astronomy, but we were gratified to read a perspicacious article by Steven Seidenberg at the ABA Journal in Business-method and software patents may go through the looking glass after Alice decision. We were light-years ahead of the competition -- i.e the rest of the legal community -- in our inexorable assessment more than 10 years ago and in years thereafter that patents had gotten totally out of hand and that something had to be done by the legal system to avert the economy being totally clogged by patent trolls and patents that had no business being granted. The Alice case decision by the U.S. Supreme Court and several other patent decisions by SCOTUS have finally led to some long-needed reform of the patent monolith, although much more still needs to be done in the future to stop the pervasively negative influence that monopoly patents and overreaching patent practices have had on technological innovation in recent years. “It’s a new world order in the aftermath of Alice,” says Dale S. Lazar, a partner in DLA Piper’s Reston, Virginia, office. ... and well it should be.